A great little mid-ranger, and a perfect reward for those gamers whove been putting off their GPU upgrade. Component manufacturers love the bombastic use of military speak and the double whammy of GTX 700 series releases from Nvidia certainly have something of the shock-and-awe about them. 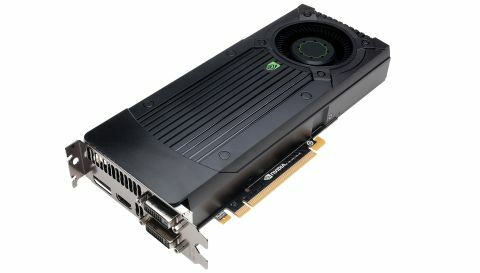 This latest card, the Nvidia GeForce GTX 760 is no different, and sets to the middle order of AMD's competing Radeon graphics cards. It's rare though that Nvidia and AMD don't decide to launch their new graphics generations - whether they're whole new architectures or range refreshers - at around the same time. Generally there's only a few months between them at worst, with Nvidia normally the ones turning up late to the party, blaming the traffic on the way over or difficulties in hitting decent yields with new process nodes. This time though it's Nvidia who are the first to arrive, eagerly clutching their new silicon, with AMD kicking their heels back in Texas. But this apparently is not a delay, AMD have decided they are going to stick with their current range of HD 7000 GPUs until the end of the year, so confident are they in their existing cards. I've got to believe though somewhere there are some AMD Radeon execs who are sweating just a little more now. When the GTX Titan and 780 dropped on the scene I'm sure they weren't that fussed - those two cards sit almost entirely out on their own and are catering for a customer that arguably AMD isn't servicing right now. But the price and performance of the GTX 770 must've been a real kick in the nuts. And now the GTX 760 is nipping in after and stealing AMD's wallet while they lay there clutching their groin. This is getting close to the real volume segment of the graphics card market then, and at £209 / $249 GTX 760 is really going to knock chunks out of some of AMD's biggest selling cards. I expect the HD 7950 has been a right good earner for them, but this new Nvidia card is often times faster and always cheaper. In the UK you'll actually find a PNY reference version for less than £200 today. Sadly, for AMD, it's the same story in comparison with the HD 7870 XT - one of my favourite cards of the last generation. That Tahiti LE-based card used to retail around £170 in the UK, and there was nothing at that price to rival it. Unfortunately, possibly thanks to a combination of popularity and scarcity, they're right now far pricier. So, what's in the GTX 760? Well, it's a little different to the GTX 770 in that it's 600 series twin is harder to distinguish. The GTX 770 was, after all, a barely disguised GTX 680, which was no bad thing when it turned up at the same price the GTX 670 is still sitting at. You might then think the GTX 760 would simply tip up with the same spec as the GTX 670 but at the same price as the GTX 660. Well, it doesn't. What we have is a spec more similar to an OEM version of the GTX 660, which never ended up in my labs. The GeForce GTX 760 then comes with 1,152 CUDA cores and runs at a 980MHz base clockspeed with 2GB GDDR5 video memory running at around 6GHz. The ol' GTX 670, the pricier elder statesman, has 1,344 cores, which is where it retains its performance lead over this newer, cheaper card. Elsewhere though the GTX 760 is holding onto some high-end component specs. That 2GB GDDR5 is running along a relatively chunky 256-bit memory bus and the GPU is running with a full complement of 32 ROPs. In performance terms that translates to a pretty consistent lead over both the Radeon HD 7950 and the HD 7870 XT in the majority of tests, with only DiRT Showdown offering AMD a genuine performance lead. Nvidia still hasn't sorted out the issues its hardware has with the global illumination in Codemaster's racing engine. Outside of Crysis 3, and the heavily-detailed Sleeping Dogs benchmarks, the sort of performance I was seeing from the GTX 760 makes it not a bad card at 1600p, let alone 1080p. In some of the gaming tests it was knocking around 30fps or higher at 2560x1600. Even taking the tougher tests into account it's rare that the GTX 760 minimum frame rate drops much below 30fps at 1080p. You can thank the 256-bit bus for a good deal of that. Sadly, despite the GPU Boost 2.0 shenanigans, there's not really anywhere to go in terms of overclocking the GTX 760. At stock settings GPU Boost 2.0 has the chip running at 1,136MHz under load, but even if you push the reference card to its limits at 1,254MHz I wasn't seeing much in the way of performance benefits. That's going to make it tricky for us to get behind the factory-overclocked cards, like the EVGA GTX 760 Superclocked card, but you can find out all about that in our GTX 760 Superclocked review . It's a powerful little card at stock speeds though - and I would hope to see some impressive small-scale versions too thanks to the reference card's shorter PCB too. For the money Nvidia have set out as the MSRP - just over £200 / $250 - the GTX 760 is looking good to take over the mid-range graphics market. If you're looking to upgrade your graphics card now, with a £200 / $250 budget, this is as good as it gets. But who should be upgrading? Well, that all depends on the card you're running at the moment and the native resolution you're going to be gaming at. If you're running at a standard 1080p resolution then pretty much any £150 / $200 card of the last generation will still be giving you decent frame rates in the latest games. And the top cards of the generation before are still gaming happily away at that resolution too. But right now AMD have really got to pull their fingers out and make sure their HD 8000 series really delivers some serious performance leads over their current hardware. The GTX 700 series has upped the price/performance level another notch. And AMD will need that lead too if Nvidia's new Maxwell GPUs manage to come out on time in early 2014. All of these benchmark tests were run on the same stock-clocked i7-3770K setup with an Asus Sabertooth Z77 motherboard and 16GB of Corsair Dominator RAM running at 1,600MHz. The gaming tests ran at top settings with 4xAA (with the exception of Crysis 3 which is a bast when it comes to AA) and these figures are from the 2560x1600 benchmark runs. The first number is the average frame rate and the number in parentheses is the minimum frame rate achieved. You can see the overclocked EVGA card only delivers a couple extra FPS here and there, with the HD 7950 lagging behind too. There are a few places where the AMD card can claim some parity with the new Nvidia mid-ranger in performance terms, but the GTX 760 is still retailing a good chunk cheaper. AMD might need to at least start slashing prices if they want to get competing again.